You are here: Home / All blog posts / Food, glorious food! I’ve been more or less floored the last few days due to a flare-up of my asthma. Mine is pretty mild and manifests mostly as a cough, which doesn’t sound so bad, but when you wake up every half-hour hacking your lungs out, it pretty much turns you into a zombie. After a day or two of thinking it was a mild case of bronchitis, I went to the doctor and got more asthma medication. Steroids are a wonderful thing! I slept ten hours last night and only woke up a couple of times. Back in action! This does not mean I’ve been entirely idle, of course. But most of my activities have been in the kitchen – I’ve been afraid to venture near the dyepots or the loom for fear of further aggravating the asthma. So instead, I’ve been making wonderful fruity things. 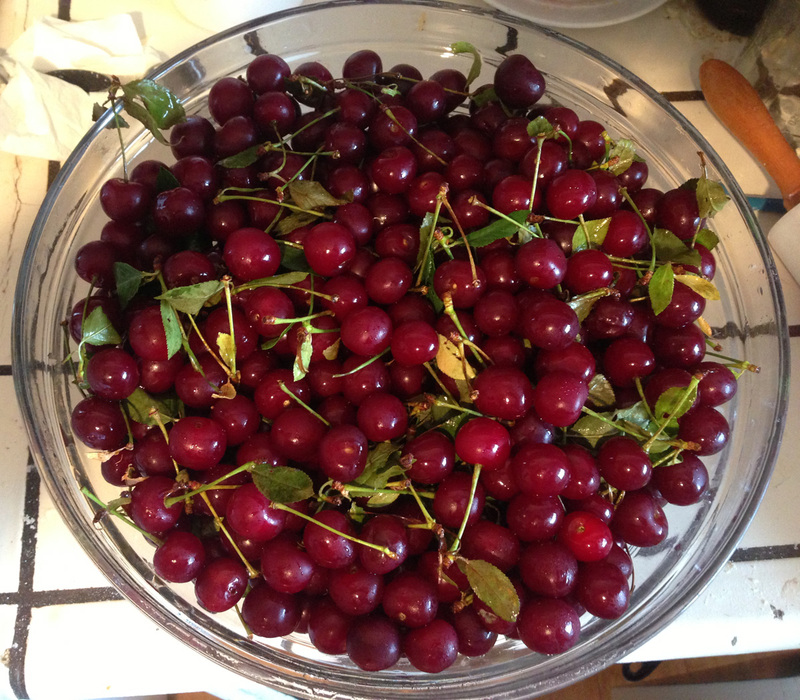 First, by some miracle, I managed to score twelve pounds of sour cherries! Sour cherries don’t grow in California as far as I know, and very few places carry them. I thought I’d missed the season entirely until my local family-run grocer announced on Facebook that they had them. I hied myself over there immediately and bought tons. six pounds of sour cherries! 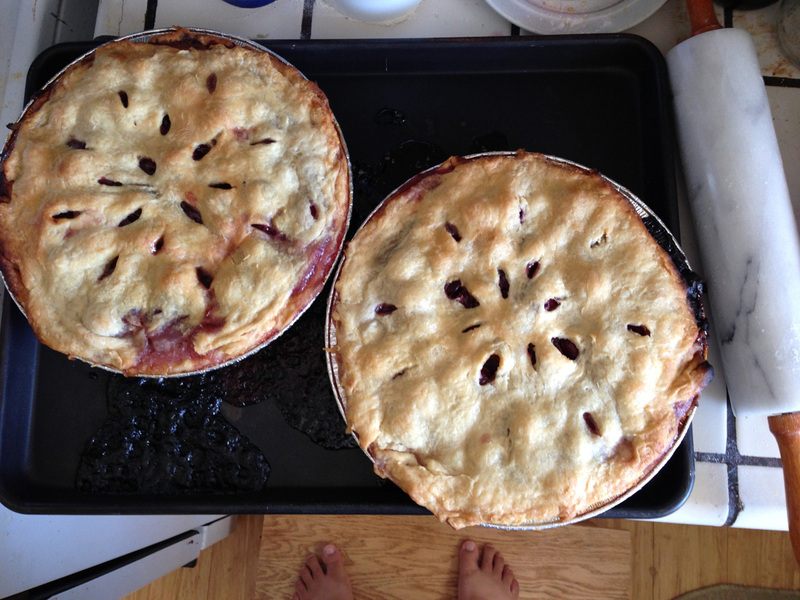 The pies turned out marvelously, probably because I made the crusts with real lard. None of that partially hydrogenated mess that you get in supermarkets: real lard, rendered at home from chunks of pork fat. (My local butcher at the farmer’s market gives pork fat away with any purchase.) Lard is legendary for making good pie crusts. 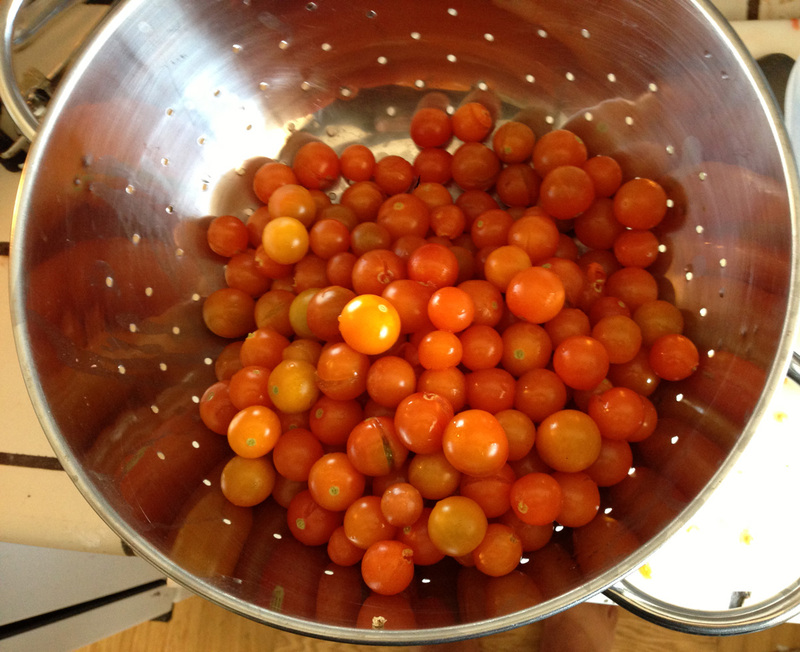 I’m particularly proud of this tomato soup because (except for the dairy products) it comes entirely from our garden. 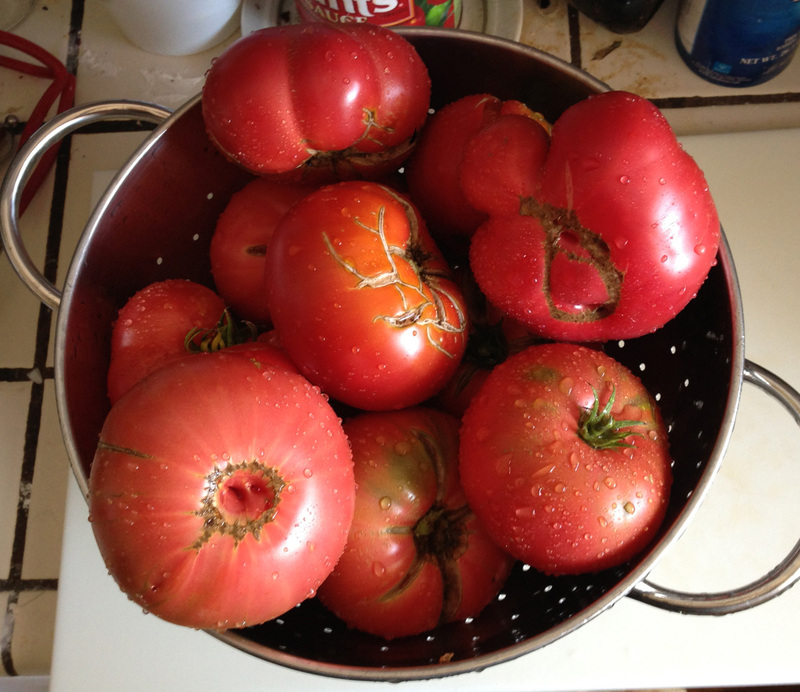 And very simple: tomatoes, onion, basil. Plus some butter, milk and cream. That’s it. Delicious. I also made twelve or thirteen pints of applesauce (from some Gravenstein apples I bought at the farmer’s market), and am currently drying nine or ten pounds of pears in the food dehydrator.Â The pears were a gift from a friend with a pear tree, and were delicious fresh – I can’t wait to see what they’re like when dried! And, I did eventually get into the dyepots (wearing a respirator to avoid any contact between dye and lungs), and dyed my experimental yarns. I dyed four skeins yellow: the unbleached skein, the Treenway-method-for-two-hours skein, the Prochem/two hour skein, and the Prochem/24 hour skein. While there is a perceptible difference between the unbleached skein and the three bleached skeins, it is very subtle. I’m not sure how much difference it would make in the finished product, especially when blended with other colors.Â Also, while there is no perceptible difference in the intensity of the yellows, the three other bleached skeins did not dye as dark as I would have liked – not sure if that’s a problem with my method or whether the bleaching affected dye take-up. I will have to do some more experiments, once I’m over the asthma. six pounds of sour cherries need to be pitted and started down the road to candied sweet cherries (to go into fruitcake later). This process takes about two weeks. I am also working on reorganizing my website, and probably merging the book site into my personal site. As part of this, I’ve been rethinking the goals of my site. Hefty stuff to ponder. This weekend will also bring a special treat: I’m going to visit John Marshall at his studio in Covelo! John is a master of katazome, a Japanese dyeing technique, and I’ve wanted to visit his studio for years. I need a book and some padding for the phoenix kimono I’m making, plus the Covelo Blackberry Festival is that weekend – which makes as good an excuse as any. It’s a four hour drive to Covelo, so it’s a weekend trip for sure. As an added bonus, I have old college friends in that area, so another stop is in order. All in all, a busy week, despite the asthma.